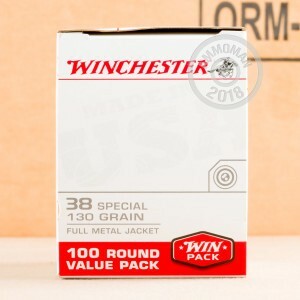 For a clean, accurate shooting experience with your .38 Special or .357 Magnum revolver, try this Winchester "white box" ammo. These .38 Special rounds are a light-recoiling, accurate target load that uses a 130 grain full metal jacket round for reduced fouling compared with the traditional lead round nose bullet. Manufactured in Oxford, Mississippi, these rounds use non-corrosive Boxer primers and reloadable brass cases. 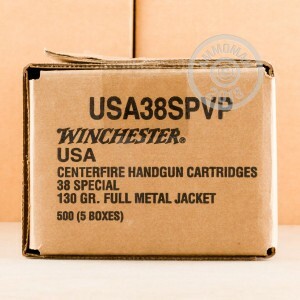 They come packaged in a 500 round case, with 10 boxes of 50 rounds each. 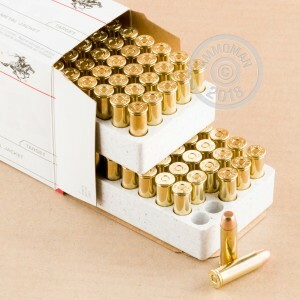 The affordable case price will give you more trigger time with your revolver for the same amount of money, and AmmoMan.com can push your costs even lower with our simple free shipping rule: Buy this case or any other ammo that puts your shopping cart total over $99 and we will handle shipping and handling for free!